The excellence of the Met orchestra and chorus formed the backbone of the performance. Nézet-Séguin led an energetic reading of the score, and a noticeably loud one, though I didn't think there were significant balance problems. Nuance and lyric sweetness were there when called for, but not wallowed in; the sinister orchestral undertow was emphasized in the first act, and both "Le veau d'or" and "Ainsi que la brise légère" were given a feverish--not to say fiendish--intensity. The final trio was taken at a more deliberate pace than I expected, allowing the harps to come to ecstatically shimmering prominence. The chorus contributed excellent work as well, with a strong, sonorous "Gloire immortelle de nos aïeux" (sung by a depleted army of the lame and wounded, with zombie-like movements while gathering for a photograph. I did like that Valentin nearly punched the photographer when the flashbulb sent a shell shock sufferer into fits.) The resurrection chorus was delivered with soaring radiance, and the entire chorus received well-deserved and enthusiastic applause at their bows with Donald Palumbo. Smaller roles were well filled, with Wendy White a strongly characterized Marthe, with sly phrasing and appropriately fussy mannerisms. Canadian mezzo Michèle Losier made a vividly sung Siébel, with warm tone and pleasing lyricism. Russell Braun's dramatic talents were underused as Valentin (a shame, given the potential of the role) but he sang well, displaying his gift for legato phrasing in a beautifully shaped "Avant de quitter ces lieux." As Méphistophélès, René Pape oozed charisma, and sang expressively and with panache. Suave, humorous, charming, and of course completely unscrupulous, Pape was a delightful devil indeed (audio of church scene here.) His French was excellent, and he gave much of his dialog an appropriately ironic twist. 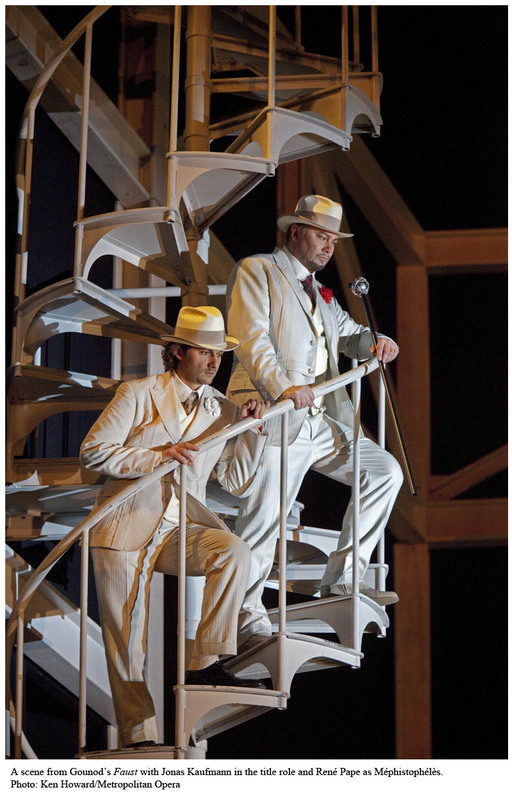 He had good chemistry with Kaufmann, and their voices blended well in their duets. "Le veau d'or," sung with a snarl and a smile (and a deceptive appearance of ease,) garnered show-stopping applause for good reason. 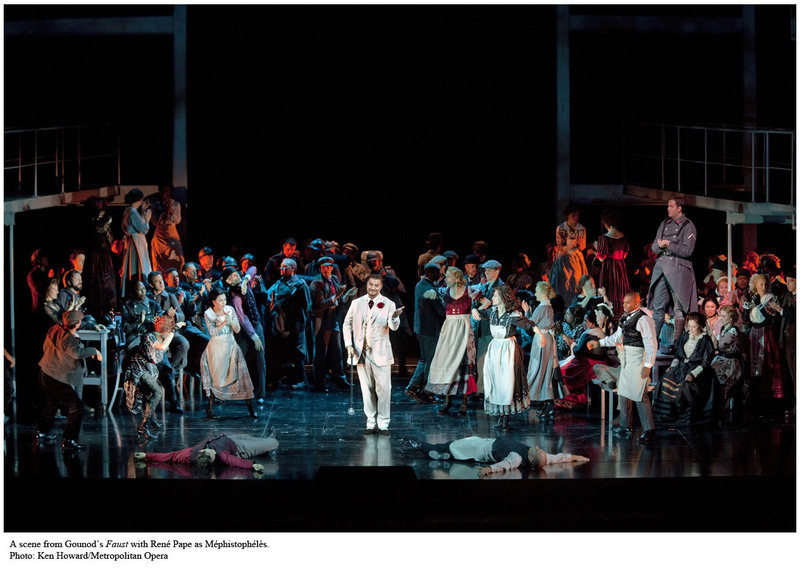 The entire performance was of remarkable caliber, and Pape's vocal and dramatic energy helped animate the evening considerably. As Faust, Jonas Kaufmann sang with elegant phrasing and elegant French, but the cumulative effect was curiously restrained. Gounod's weak-willed sensualist was not given a clear alternative development by McAnuff; in his opening scene in the laboratory (inclusive staged overture) he is clearly a broken man, horrified by the history he has helped to create, but the rest of the opera gave him a limited range of stage action. Faust is clearly Méphistophélès' pawn, and frequently dismayed by this--and his ardor for Marguerite was convincingly acted and sung--but I didn't feel that the performance fully ignited. Kaufmann did sing very expressively, with his thrice repeated "Rien!" descending into bitter despair, and his thrice repeated "Dieu!" a cry of anger rather than an implausible expression of piety. His initial "Je t'aime" caressed the melodic line as ecstatically as if it were a proxy for Marguerite herself, and "Salut! demeure chaste et pure" was sung with admirable sensitivity. Guilt, grief, and tenderness were all given musical expression in the final scene, before Faust is seized by the devil (I'd swear I saw Kaufmann go gray.) The final tableau returns us to the frame of the hallucination: the aged Faust's suicide in his laboratory. Like Faust, I was left mourning missed opportunities. I listened to the show on Met radio last evening. Your review confirmed some of my own observations. So, two of the productions I most wanted to see at the Met turned out to be disappointments--this and Don G. Hmmm. I hope there are other places to experience ectasy in opera. Not going to lie: I was skeptical when I heard that the setting was going to be during and between the World Wars. I wondered if there was going to be any way for the singers to salvage the set design. I'm still going to see the broadcast, but I'm glad that I know now that it's a wonky performance. Shame about Poplavskaya-I was looking forward to hearing her for the first time! @Gale Martin Well, of course there are plenty of places to experience ecstasy in opera! And the orchestra was at their fabulous best last night... but my beloved Met is not a Mecca for creative/thoughtful productions. @Christie Yeah... I still don't think the concept was a fatally flawed one; unfortunately it just wasn't pulled together. Poplavskaya can be a rather uneven singer, so keep your fingers crossed. I was also disappointed because, from the balcony, her reactions to Faust seemed... stoic. Which, my mother and I agreed, lacked plausibility for several reasons. Um, yeh. Agree with all of that. Not a comprehensively thrilling evening by any stretch of imagination but very rewarding in some important respects nonetheless. Meph. presents the most opportunities and in the context of the opera in particular it somehow seems wrong when he doesn't walk away with the show. I would expect no less from Pape, and he did in fact deliver. Jonas wasn't as dynamic as elsewhere (attributable at least in part to both the nature of the character and inadequacy of direction) and had a couple of (for him) slightly rough passages but there was also some genuinely beautiful singing that would have been worth the trip even in the absence Pape and the superb orchestral performance. That performance, so precisely described above, really made the most that anyone could reasonably hope for from a score that is a genuinely pedestrian in spots and even over some stretches. The production was incomplete in conception and flawed in execution but one has learned to limit one's expectations with respect to the Met's dramatic efforts. Overall, it goes without saying that no opportunity to hear either Jonas or Pape should be missed, much less both of them together. The terrific conducting and superb orchestral execution was a nice bonus. "I was also disappointed because, from the balcony, her reactions to Faust seemed... stoic"
That's because you were in an opera house - not because you were in the balcony. I've seen Poplavskaya both in video records and Live in HD, and her acting is just like that. I wonder if we should even call it acting. She's really a bad actress... and definitely not one of my favourite singers either! P.S. I'm going to Faust live in HD on Dec 10. @marcillac I enjoy our debates so much, but agreeing on things is nice too. :) As you say, getting that much out of the score was really a treat. You'll get no arguments from me on prioritizing JK and Pape, either. @Placido Zacarias Hmm... although I found Poplavskaya wooden on Tuesday, that's not been my experience either of the other times I've heard her live. In the past I've found her vocally expressive, if unsteady. Her Violetta was intensely moving to me, and her Elisabetta (Don Carlo) had a specificity in fairly limited gesture which made repression and fury at her powerlessness clear (I thought.) She's not one of my favorite singers either, but I wouldn't write her off as a bad actress. the most expressive idea with the worst acting. Alas, not able to see in person so I content myself with the HD simulcast. I left yesterday's equal parts exhausted and exhilarated...and also confused. Exhaustion and exhiliration were due to the strong vocal performances, the score, the suave intensity of Rene Pape, the dynamic stage (screen?) presence of Jonas Kaufman... Confusion stemming from what you clearly diagnosed: the atomic scientist concept is not maintained in a logical and consistent way. It is an intriguing idea, but one that is relegated to a few costumes, some props, and a few flashes of light. But at the end of the day, the music and the great performances form the pit to the stage won me over. @GBliss Glad to hear the musical and dramatic value of the performances continues to be high. Better frustrated than bored by a production, I suppose, but so much more could have been done with it.